Watch a video of The Skull in the Wood. Some wonderful pictures, maps and stories from Calstock and Stoke Climsland Schools in Cornwall have winged their way to me - take a look at the blog section to see more. Off to Stoke Climsland County Primary School in Cornwall, where we're doing a whole day of spooky story-making along with pupils from Calstock School. It's the day after Halloween! This week I'm doing a Devon book tour for World Book Week in conjunction with the wonderful Crediton Community Books, and visiting Chulmleigh Academy, Willand Primary, Maynard School in Exeter and Okehampton Primary. Happy World Book Week to you all! And next week I'm off to Lydford Primary School. I'm visiting two schools this week - Bow Community Primary School in Crediton and Thorverton C of E Primary School in Exeter. Looking forward to meeting you all! A wonderful pack of stories has arrived with me from Tor Bridge High school in Plymouth - I visited in November to kick off their Library Winter Writing Competition - and there are some spine-tingling results. Check my blog for details. Off to Eggbuckland Community College in Plymouth on Monday 22 June to do the opening of their Carnegie Day. Very exciting! Looking forward to what students have made of that wonderful list of books. Just back from my visit to Nottinghamshire for the Brilliant Books Award (what a fabulous name!) I met years 7s and 8s at Ashfield School and year 7s at Chilwell School, plus students from other close-by schools. Thank you for all your fantastic questions - you were a great audience and it was lovely to meet you. And a big thanksto Brilliant Books and to two lovely librarians who made it all happen, Alex Sankowski and Rachel Marshall. Well done to all those creative writers at Okehampton College - you sent shivers down my spine! Looking forward to seeing some finished work. 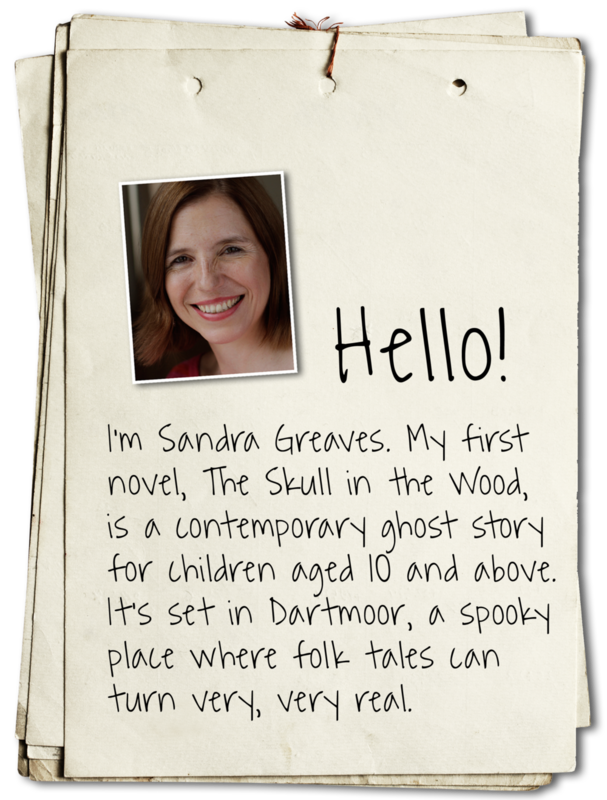 Hello to all the year 5s and year 6s in Harrowbarrow School in Cornwall - I hope you enjoy the rest of the book! What fantastic ghost story writers you are - and some you have strong stomachs and a keen taste for blood! I'm looking forward to seeing any finished stories - and I especially like ones with pictures... Miss Pinfield has offered to send them on to me and I'll put bits from my favourite ones on my website. And hurray! The Skull in the Wood has been nominated for the Brilliant Book Award in Nottingham. I'll be going there to meet students from two of the participating schools there - Ashfield School and Chilwell School - on 11th February. Looking forward to it! Alas I didn't win the Waterstones Children's Book Prize - but lovely to be nominated!